When it comes to oral health issues, the lion’s share of attention seems to be placed on a few key issues relating to the mouth. Tooth decay and gum disease seem to receive most of the attention from the dental world and, for the most part, that is perfectly fine. However, in today’s post, we are going to go off the beaten path a bit and talk about bruxism, also known as teeth grinding. While most people probably grind their teeth and clench their jaws at some point during the day, the real issue is when people are unable to control grinding their teeth in their sleep. This can work to damage the teeth and, in today’s post, we are going to go over bruxism in detail and what you can do to treat this medical condition. 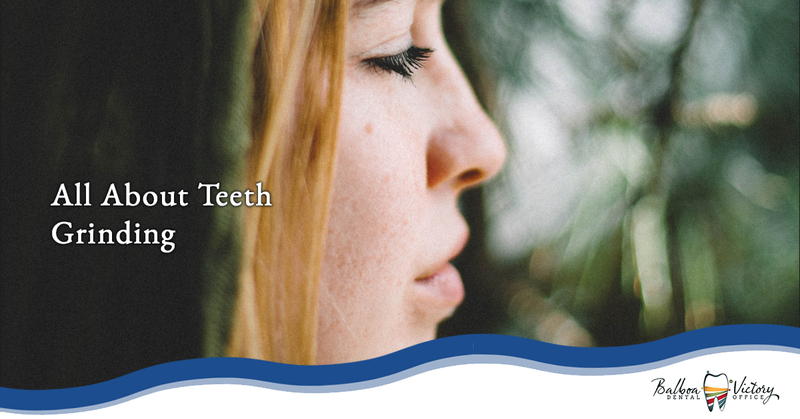 While teeth grinding can be caused by anxiety and stress, it often occurs when a person is asleep and seems to be caused mostly by an abnormal bite or missing/crooked teeth. This makes bruxism particularly hard to notice at first because, almost exclusively, people are asleep when they start grinding their teeth. Most people begin to notice the effects of their nightly teeth grinding because they wake up with a dull, constant headache or a sore jaw. Additionally, people often learn that they have bruxism because a spouse or loved one will hear them grinding their teeth at night. What Can a Person do to Stop Grinding Their Teeth? If you are excessively grinding your teeth at night, your dentist will most likely advise that you start wearing a mouthguard at night to keep your teeth from touching each other and your jaw occupied. If stress is determined to be the reason for your teeth grinding, your dentist or doctor will most likely advise you to reduce your stress by attending stress counseling, exercising, taking muscle relaxants, or seeing a physical therapist. Below, we have listed a few tips to help with your bruxism. Avoid or cut back on foods and beverages that contain caffeine. Do not chew on items other than food and avoid chewing gum as it allows your jaw muscles to get used to clenching, making it more likely that you will grind your teeth at night. Train yourself not to grind your teeth during the day by positioning the tip of your tongue between your teeth. This trains your jaw muscle to relax. Hold a warm washcloth against your cheek in front of your earlobes. This will help to relax your jaw muscles before sleep. If you are suffering from bruxism, please contact us today at Balbo Victory Dental Office and schedule an appointment. We will work with you to come up with a solution for your tooth grinding and give you some tips to help reduce the chances that you will grind your teeth at night. Don’t ignore this issue and let it become a major problem, contact us today and let us help you.